Daniel McGowan is executive director of Deir Yassin Remembered. This commentary originally appeared in The Daily Star (Lebanon). Today, an extraordinary event will take place in Geneva, New York: the dedication of the first US memorial to the victims of the Deir Yassin massacre. This event was organized by Deir Yassin Remembered, an international human rights organization, half of whose current board includes Jews. On April 9, 1948, members of the Irgun and the Stern Gang massacred over 100 Palestinian men, women and children in the village of Deir Yassin, near Jerusalem. The Deir Yassin massacre marked the beginning of the depopulation of over 400 towns and villages, and the exodus of 750,000 Arabs; it also marked the beginning of the Palestinian Nakba, or catastrophe, and the creation of a Palestinian diaspora in refugee camps and in neighboring Arab countries. But why build a memorial to the victims of Deir Yassin in the US? For Palestinians and most Arabs to remember Deir Yassin is a form of resistance to the humiliation and dehumanization Palestinians have suffered for over 55 years, much of it sponsored and nurtured by the United States, through its unwavering support for Israel. To memorialize Deir Yassin is a cry for the world to remember the ethnic cleansing Palestinians have endured, and the apartheid conditions under which they now live. As writer Elie Wiesel often proclaims: �The opposite of love is not hate; it is indifference.� If so, the indifference shown toward Palestinian history, in Israel and in the US, is worse than hateful. Jews rightly protest against Holocaust denial, and the world listens. Palestinians rightly protest against Nakba denial and are often told: �Get over it.� In either case, such denial is hurtful and is no basis for peace. The Geneva memorial is a bronze sculpture depicting a mature olive tree, a symbol of peace, uprooted in the quest to build a Jewish state on land owned and long-inhabited by Muslim and Christian Palestinians. The tree�s tortured, angular lines illustrate the Palestinian dispossession that began in 1948 and continues today. The extended branches add movement and drama; they appear dead and yet are still alive. The torn roots of the displaced olive tree are partially wrenched from the earth; their continued attachment to the ground symbolizes clinging to the motherland. Members of Deir Yassin Remembered believe there cannot be true peace as long as the truth is avoided and as long as the sad history of the Palestinians is ignored. 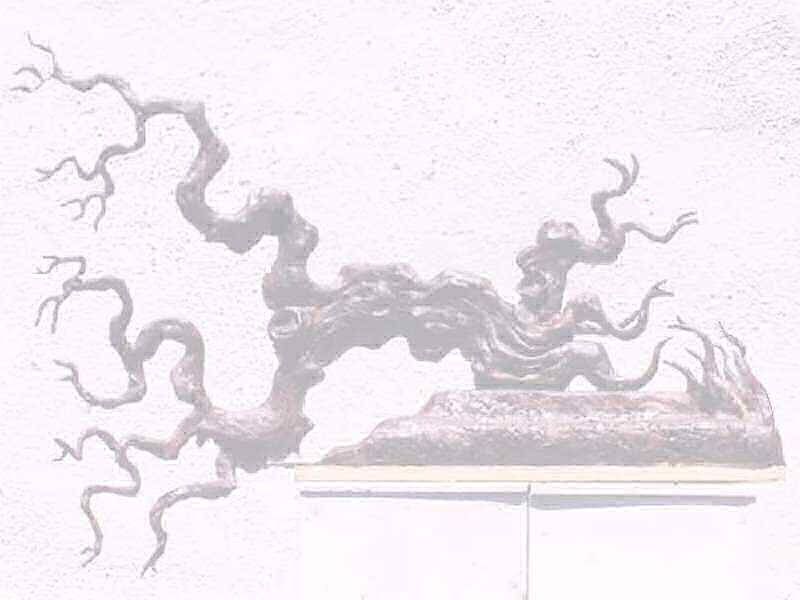 The bronze sculpture depicts a mature olive tree, a symbol of peace, uprooted in the Zionist quest to build a Jewish state upon land owned and long-inhabited by Muslim and Christian Palestinians. The tree's tortured, angular lines illustrate the many decades of Palestinian dispossession and dehumanization that began before 1948 and continue today. The extended branches add movement and drama; they appear dead and yet are still alive. The torn roots of the displaced olive tree are wrenched from the earth, root-remnants still entrenched, clinging to the motherland. Enjoying special status in holy books, people of all religions relate to the olive tree as a symbol of peace and enlightenment; it is mentioned six times in the Qur'an. Many visitors will come from the award-winning hotel, Geneva-on-the-Lake, located on the adjacent property owned by the Audi family. Mrs. Aminy Audi has been a patron of Deir Yassin Remembered since its inception in 1995. One of America's premier small resorts, Geneva-on-the-Lake is "An oasis, a little island of beauty, peace and friendliness in a busy world." Visitors to the memorial will view the statue framed by trees and the beautiful Seneca Lake, about 30 feet away. They will sit on a curvilinear massive bench carved from local-quarried red Medina sandstone (pronounced "me di na" in upstate New York; "ma deena" is an Arabic word that means 'city'). Visitors may stop, look, and linger for as long as they wish. And when they do move on, they will take with them concern over this tragic event and its relevance in the contemporary struggle for Palestinian human rights. The sculpture is the design and creation of the renowned Arab-American artist, Khalil Bendib, among whose works is the statue of Alex Odeh, murdered in Santa Ana, California in 1985, in a hate crime against Arabs. Khalil Bendib's studio is in Berkeley, California. The bronze plaque describing the Deir Yassin massacre includes the following Haiku by Randa Hamwi Duwaji, DYR Director of Poetry and Verse, author of "Heartbeats in the Wind: Reflections of an Arab Woman." Together with the Arabic rendering of the poem, these short, powerful verses closely and explicitly reflect the significance of the sculpture. The human implication is reinforced as both art forms come together to create a moving, harmonious whole. This is the third memorial to the victims of Deir Yassin. The first was a simple stone with a plaque at Dar Al-Tifl Al-Arabi, across from Orient House in East Jerusalem where Hind Husseini sheltered orphans of Deir Yassin on April 10, 1948. The second memorial was dedicated in 1988 on the fortieth anniversary on the grounds of the Kelvingrove Museum in Glasgow, Scotland. Deir Yassin Remembered shall one day build a groundbreaking memorial and information center at Deir Yassin, across the valley from Yad Vashem, the most famous Jewish Holocaust Memorial. The site of the Deir Yassin massacre is envisioned as the ideal location where Jews and Arabs can learn, understand, and come to terms with their shared history, and with each other. To date, contributors to the First Deir Yassin Memorial in the United States are as follows: site preparation by Daniel Wobig, stone bench cutting and finishing by Scott Fratto, 12-foot red Medina stone by Walter Johnston. In addition we have received three "patron" contributions of $5,000 or more: one from Margaret and (the late) Issam Nashashibi of Dawsonville, Georgia; a second from Nabil Qaddumi from Kuwait; and a third from a Jewish donor in New York City who wishes to remain anonymous.